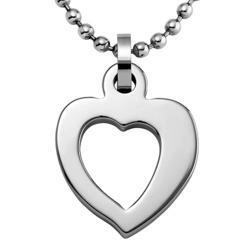 With Valentine's Day quickly approaching, tungsten carbide's leading retailer introduces its first tungsten women's heart pendant jewelry. Just in time for Valentine’s Day, Tungsten World has added two exclusive tungsten heart pendant designs to their extensive selection of tungsten carbide wedding bands, tungsten rings and tungsten jewelry. Tungsten World, an online leader in tungsten ring sales, is also treating its customers with special Valentine’s Day wedding bands and jewelry promotions leading up to the holiday. The two newest additions to Tungsten World’s tungsten pendant collection are the CUPID and EROS. Both women’s pendants have open heart shaped design made of tungsten carbide with stainless steel ball-chain necklace. The CUPID open single tungsten heart pendant features a simple, single heart silhouette design, while the EROS floating double heart pendant is a cut out two heart design into the heart shaped tungsten pendant. Each and every pendant is made of the highest quality tungsten carbide from the industry-trusted Tungsten Forever band, giving it a long-lasting finish and shine. The CUPID and EROS make the perfect Valentine’s Day heart pendant jewelry gift for the special woman in any man’s life, and pairs nicely with any of Tungsten World’s many tungsten wedding bands or tungsten engagement rings for possible Valentine’s Day proposals. Also in time for Valentine's Day, Tungsten World is offering two great promotions for its customers looking for the perfect tungsten carbide gift. Those shopping on TungstenWorld.com leading up to Valentine's Day can get one free CUPID tungsten heart pendant with any tungsten ring purchase of $300 or more, normally a $99 retail value. The pairing of the perfect tungsten ring along with the tungsten heart pendant is sure to make any Valentine's Day a special occasion. And the savings don't end there, Tungsten World is also offering customers the chance to save $35 off their order and get in the Valentine's Day mood by using the promo code: Love35 when ordering on TungstenWorld.com.